Today we will discuss a few multiple choice practice questions involving work, energy and power. Questions in this section were discussed earlier on this site. You can access them by clicking on the label ‘work energy power’ or by trying a search for the required word using the search box provided on this page. (1) A sphere A of mass m moves with speed v and kinetic energy E along the positive x-direction and collides inelastically with another identical sphere B at rest. After the collision sphere A moves with kinetic energy E/3 along the positive y-direction. What is the speed of sphere B after the collision? Since the kinetic energy is directly proportional to the square of speed, the speed of A after the collision is v/√3. Momentum is conserved in all collisions (elastic as well as inelastic). 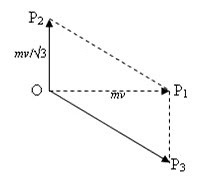 The momentum of sphere A before the collision is mv and is directed along the positive x-direction. This is the total momentum of the system since the initial momentum of sphere B is zero. But │OP3‌│ = mvf where vf is the speed of sphere B after the collision. A force of constant magnitude acting always at right angles to to the direction of motion of the particle will supply centripetal force required for uniform circular motion. In uniform circular motion the speed of the particle is constant. [The velocity is not constant since the direction changes continuously. The momentum and the acceleration also are not constant for the same reason]. Since the speed is constant, the kinetic energy of the particle is constant [Option (c)]. Ei = 0.5×10×65 + ½ ×0.5×202 = 325 + 100 = 425 J.
Ef = ½×0.5×402 = 400 J. Therefore, the energy lost by the ball because of air resistance is Ei – Ef = 425 J – 400 J = 25 J. [We have taken the leftward momentum as positive and that’s why the total momentum is positive. If you take the leftward momentum as negative, the total momentum will be negative. But this won’t affect your final answer and the energy lost during the collision will be positive].